This may be one of the more obvious posts I have made on my blog. The return of five-time All-Star Chase Utley to the Phillies line-up has added a much needed spark. In 21 games, 20 starts, Utley has hit .275/.383/.500 with 3 HRs, 12 RBIs, 3 SBs, and 12 walks with excellent defense. But as hard as it may be to believe now, many commentators thought Utley was done upon his return. 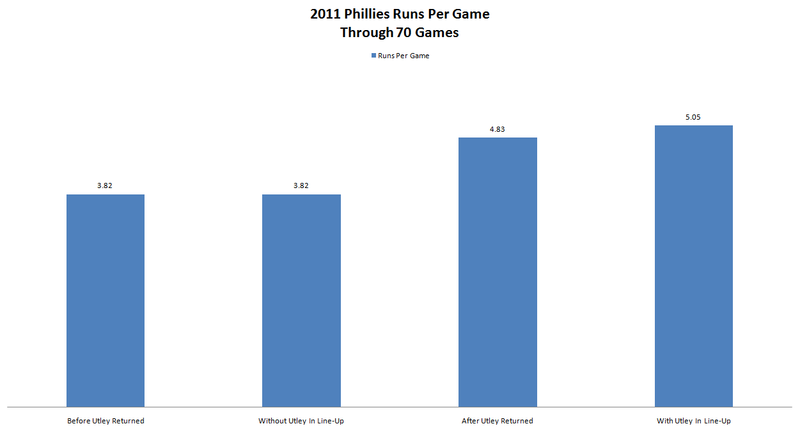 When comparing run trends on May 28, I found that the Phillies were scoring just under the league average in runs per game and speculated that it would get better once Utley and Dom Brown readjusted and adjusted, respectively, to Major Leauge pitching. That has happened: the Phillies have added .12 runs per game to their average in just 24 games since Utley’s return and have a .9 runs per game differential, .4 runs per game higher than the next closest team (Cincinnati). The Phillies now have the second highest runs per game total in the National League among division leaders and are now .1 runs per game above the league average instead of .02 below it. Chase returned on Monday May 23, 2011 against the Cincinnati Reds, going 0-5 with a strikeout in a 10-3 Phils win. He followed it up with a 1-4 night, a day off, and a 1-5 night, putting him at 2-14 to start his season. 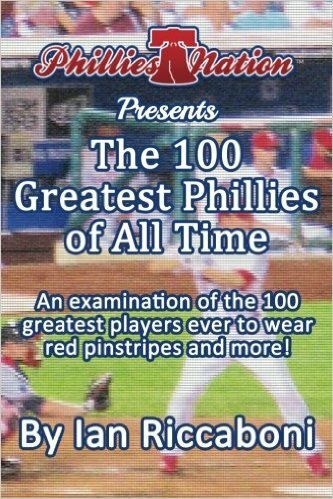 But since his return, the Phils have caught fire, posting a 16-8 record including their active 7-game winning streak. Undoubtedly, the Phils have benefited from having the three top pitchers in the league in xFIP (Halladay, Hamels, and Lee), but Utley’s .8 WAR in just 21 games out-paces replacements Wilson Valdez at -0.7 and Michael Martinez at -0.3, adding somewhere between 2 and 2.4 wins immediately to the Phils if adjusted for playing time. 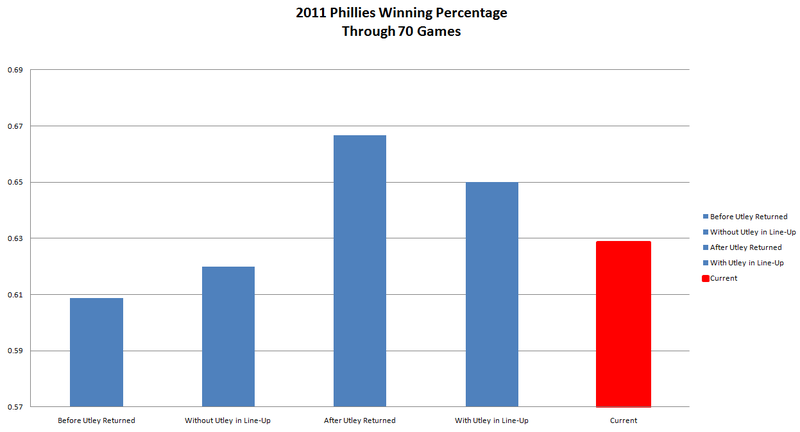 Below are some graphical illustrations of the Phillies’ offensive success since Utley’s return. They’ve won 16 of 24 since his return, 13 of 20 when Utley starts, have scored a full run more per game since his return, and score 1.2 more runs per game with Utley in the line-up. Click each graph to expand. Update: Saw Dash’s Tweet at about 12:30 PM when I stepped away from lunch. Did not see that he had posted an article very similar to mine an hour before I did. Dash’s is a little less optimistic, and honestly, more responsible in his assessment that it is all not Utley. The Phils have had great pitching and Valdez and Martinez are obviously not MLB starting second basemen material, but Utley has definitely had an impact in a small sample size.